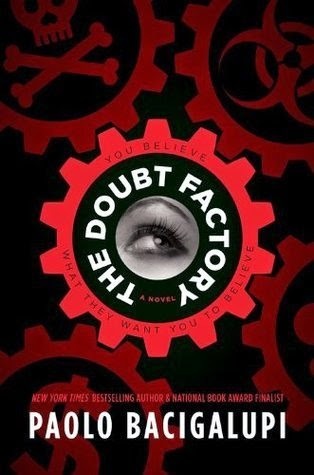 In this page-turning contemporary thriller, National Book Award Finalist, Printz Award winner, and New York Times bestselling author Paolo Bacigalupi explores the timely issue of how public information is distorted for monetary gain, and how those who exploit it must be stopped. Everything Alix knows about her life is a lie. At least that's what a mysterious young man who's stalking her keeps saying. But then she begins investigating the disturbing claims he makes against her father. Could her dad really be at the helm of a firm that distorts the truth and covers up wrongdoing by hugely profitable corporations that have allowed innocent victims to die? Is it possible that her father is the bad guy, and that the undeniably alluring criminal who calls himself Moses--and his radical band of teen activists--is right? Alix has to make a choice, and time is running out, but can she truly risk everything and blow the whistle on the man who loves her and raised her? I am not too sure what I really felt about this book, it took some time to really get into the story. In the beginning it is hard to understand what exactly is going on and who the key players are in the story, but as I continued I was intrigued with all the secrets that everyone seems to be keeping. Alix has grown up not realizing how much of her life is really a lie, so many people around her are hiding the truth of things, so much is twisted to look different to the eyes of the public. I think that Paolo uses this book to show that not everyone in our lives are necessarily telling us the whole truth, it is very easy to hide certain things. And also how different people can see things in different ways, Alix's dad works for a firm that supposedly distorts the truth about scientific experiments by huge companies, but is everything truly his fault. Is her dad really the one behind all these things, there are so many different views, this book shows that not everything is truly black and white, there is always some gray to be found in a story. Alix is a character I had trouble connecting with, she is blind to so much around her, and sometimes it felt like she was too naive for her own good. She doesn't believe anything evil that is said about her father (which is definitely understandable) but the fact that it takes so much time for her to truly dig up the truth herself, really made me feel like she would prefer to be blind to the world around her. It was this that made the book hard for me to read, I wanted Alix's character to be a bit more headstrong and really take a look at all the evils of the world, instead of living in her own world. The one thing about this book that really got me was how Bacigalupi uses the story to show how easily trust can be broken and yet readers also see how much family really means to Alix as she deals with the dilemma of who to really trust. The scary and true thing that Bacigalupi brings up in this book is how easily public information can be distorted and used against us. Honestly, though this was a long book, and there was a lot happening that felt like it didn't truly matter to the story, this was a scary kind of realistic story. I think this is a story worth checking out just to see what happens with everything. This will not be a book for everyone, but there are some great underlying issues that are touched on to make you think about the real world and what is happening around us every day.